“Trifle” means something of little value. To me, “A Trifle” is of great value. Traditionally, this European dessert is layers of cake soaked in an alcohol of some kind, jam, custard and whipped cream. Of course, here in The States we’ve bastardized it. 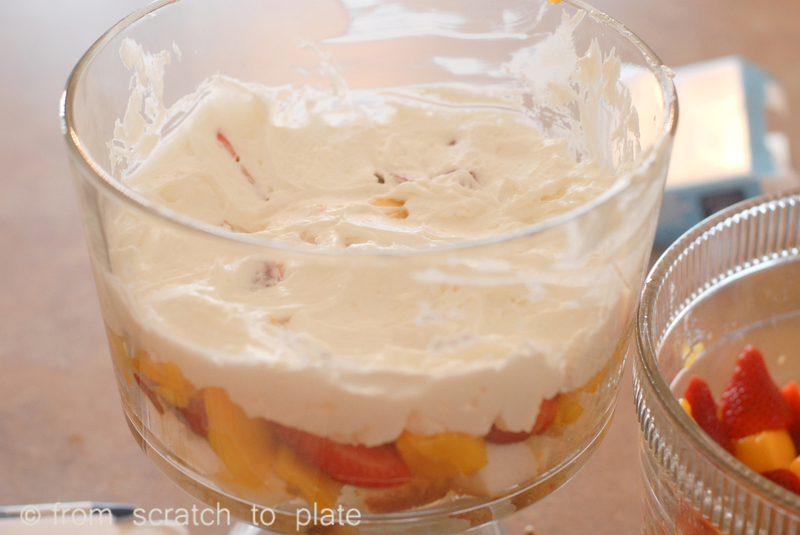 Anything that is layered cake (or even brownies or cookie chunks) with a pudding or whipped cream is called a “trifle”. 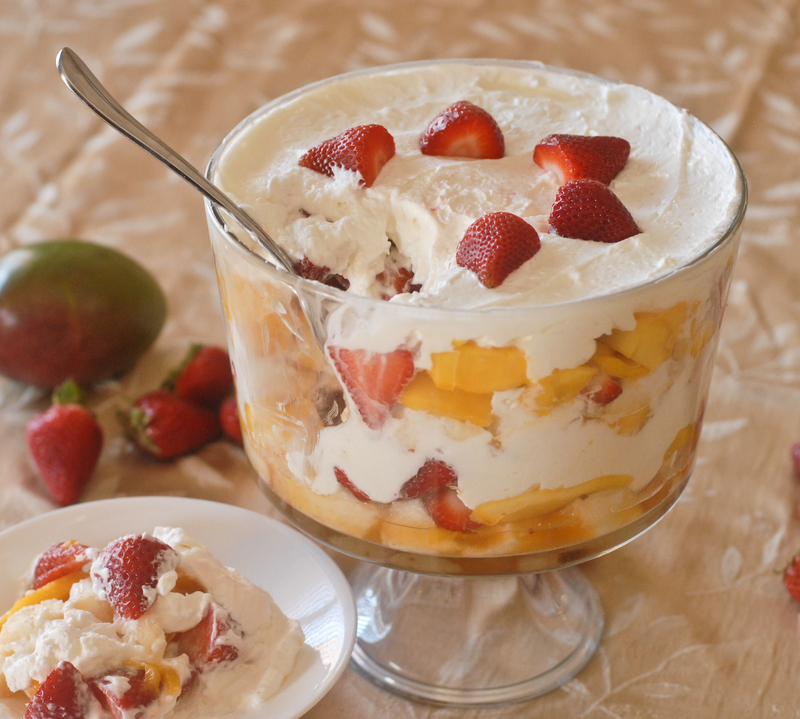 We also tend to use fresh fruit in our “trifles” here in the U.S. But, hey, who cares if it’s traditional or not, whatever you call it (Capulet or Montague), it’s dang tasty, and the perfect dessert for warmer weather. 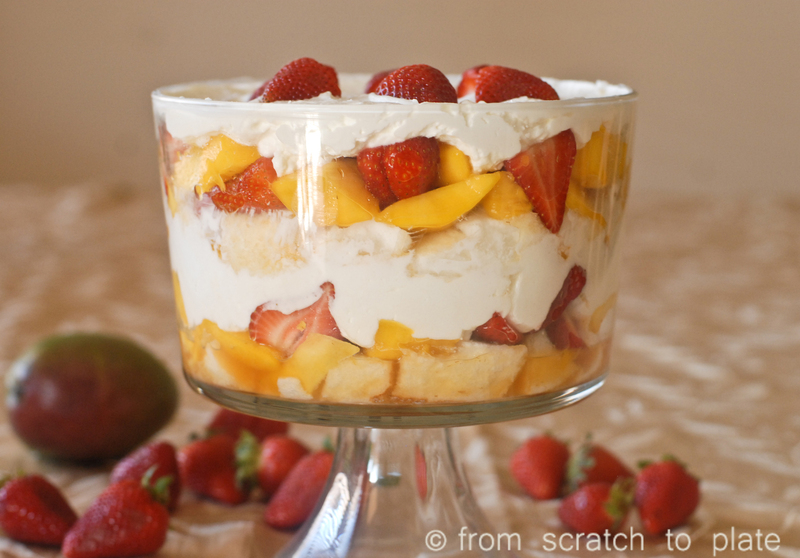 In this trifle, I avoided the alcohol, and instead use the natural juices from the strawberries and mangoes to drench the cake. Instead of custard I used a sweet lime cream cheese folded with whipped cream for a light filling that perfectly compliments the mangoes. 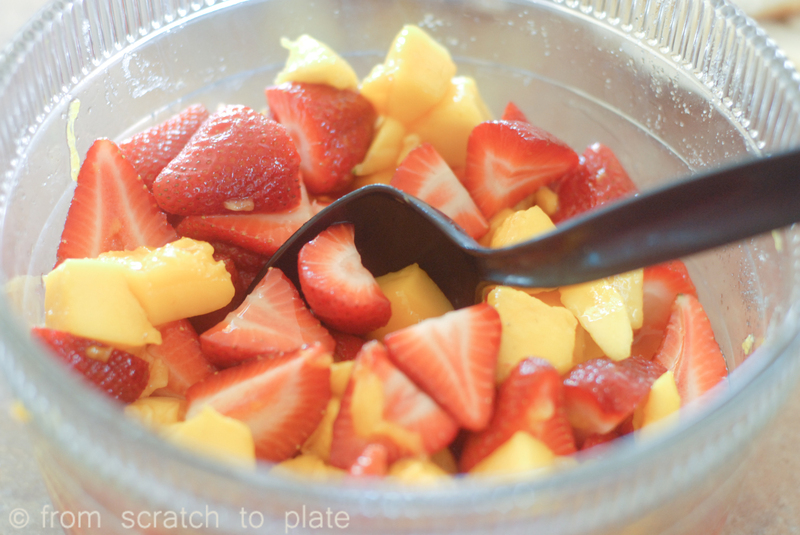 In a large bowl, combine mangoes, strawberries and 2/3 cup sugar. Let sit for at least 20 minutes to create juices. Meanwhile, whip the cream until very thick. See this post if you need help on this part. Scrape whipped cream in to a separate bowl. In your mixer bowl, combine cream cheese, lime juice and 1/3 cup sugar. Whip until smooth and fluffy. Fold the whipping cream into the cream cheese mixture. Folding is a method where you softly and slowly cut through the mixture, and “fold” it over, until it is mixed. It allows the whipped cream to stay as fluffy as possible. If you stir it in, it will turn liquidy. Here is a good video that shows the method. 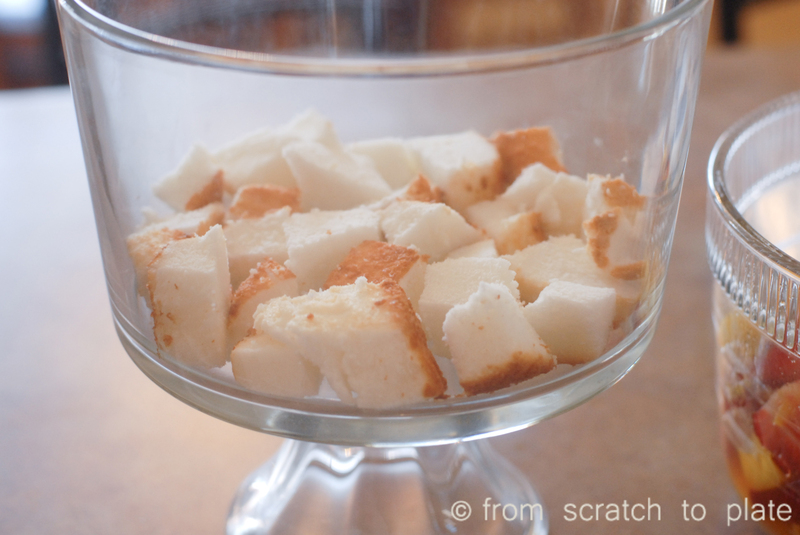 Cut or break your angel food cake into chunks. In a trifle dish or large bowl, lay down a layer of cake. 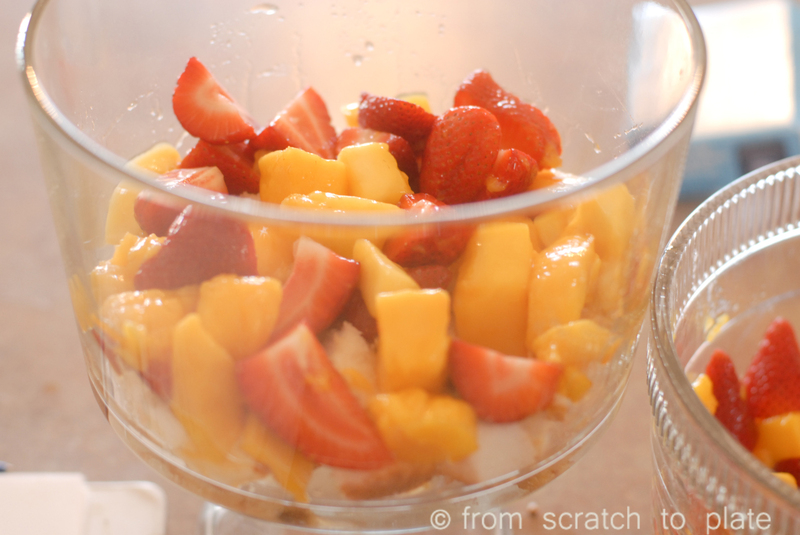 Top that with fruit, then the cream mixture. Repeat. 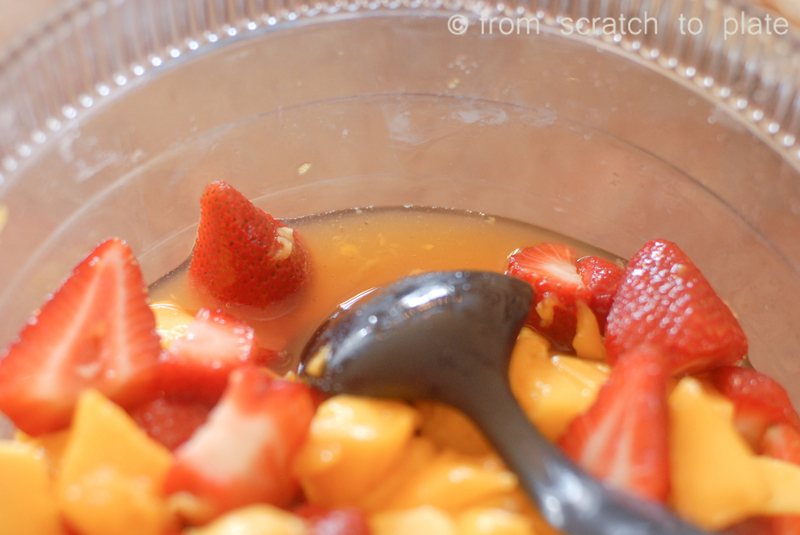 Be sure to include the juices with the fruit so it can soak down into the cake. 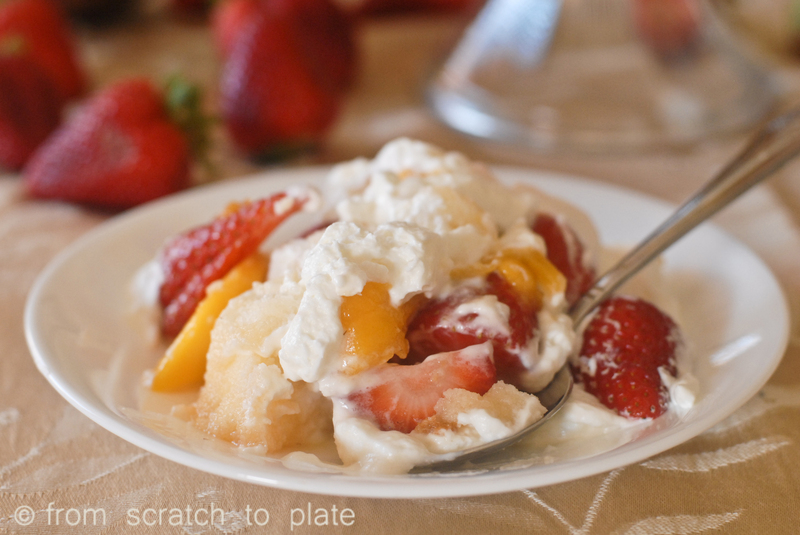 Finish it off with the whipped cream mixture, and garnish with fresh fruit. REAL food alert: A store bought angel food cake will be full of all sorts of additives, including chemical preservatives and artificial flavors. You may be able to buy a more natural one at a store like Trader Joes or Whole Foods. Making one yourself does take a special pan, and a bit of work, but they are SOOOO much better tasting. Eventually I’ll post a recipe. Meanwhile, try this one. Whipping Cream: check for additives and artificial flavors in your whipping cream. For more info, check out this post.